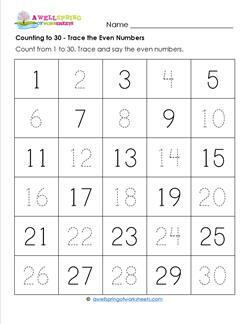 These counting to 30 worksheets are for kids who’ve mastered counting to 10 and counting to 20. 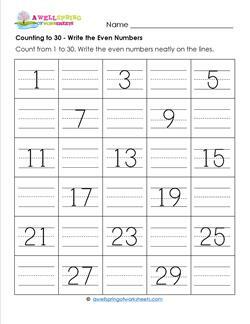 While still writing numbers 1-20 and counting to 20, they add on to those numbers 21-30, providing more of a challenge. A great way to start mastering number order for 21-30 before going into first grade. 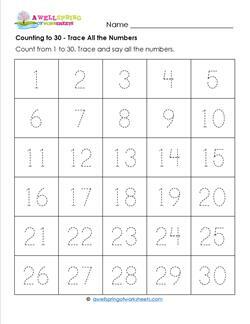 Rather than counting objects, these worksheets have kids trace, write on the lines, or fill in the blanks for numbers 1-30. Great assessment tool, too. CCSS No specific standard for kindergarten. Counting to 30, have kids say all the numbers out loud in order while tracking with their fingers. Trace the even numbers neatly and say these out loud. Counting to 30, have kids say all the numbers out loud in order while tracking with their fingers. Trace the odd numbers neatly and say these out loud. 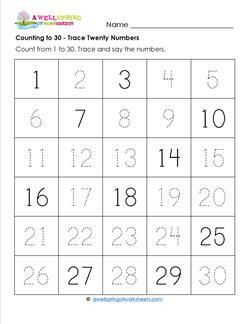 Counting to 30, have kids trace the twenty dashed numbers neatly. Then have them say all the numbers out loud while tracking with their fingers. Counting to 30, have kids trace all the dashed numbers neatly. Then have them count all the numbers out loud in order while tracking with their fingers. 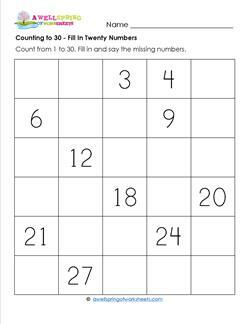 Counting to 30, write in the missing even numbers. Have kids say all the numbers, then just the even numbers, out loud while tracking with their fingers. 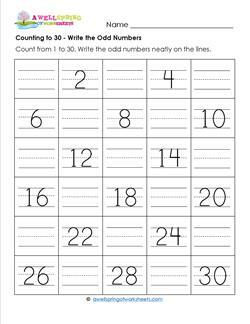 Counting to 30, write in the missing odd numbers. Have kids say all the numbers, then just the odd numbers, out loud while tracking with their fingers. 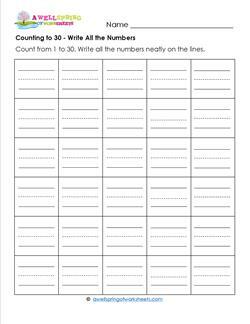 Counting to 30, have kids write the missing numbers on the lines. Then have them say all the numbers out loud while tracking with their fingers. 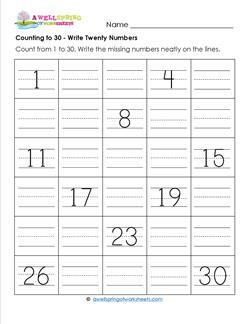 Counting to 30, have kids write the numbers 1-30 neatly on the lines. Then have them count out loud and in order while tracking with their fingers. Counting to 30, fill in the missing odd numbers. Have kids say all the numbers, then just the odd numbers, out loud while tracking with their fingers. 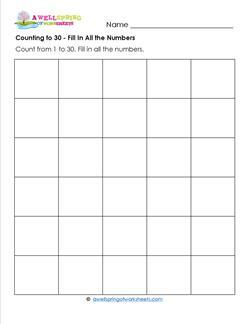 Counting to 30, have kids fill in the missing numbers in the boxes. Then have them say all the numbers out loud while tracking with their fingers. 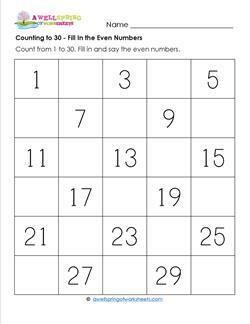 Counting to 30, have kids fill in the numbers 1-30 neatly in the boxes. Then have them count out loud and in order while tracking with their fingers.